Giveaway runs November 1 through November 11, 2016. Winner's will be notified via the email address entered below on November 14, 2016. By entering this giveaway you enter to win one of the 25 prize and you are agreeing to be added to the newsletters of the following authors: KaLyn Cooper, Paige Tyler, PJ Fiala, Marissa Dobson, Debra Parmley, Sabrina York, Donna Michaels, Elle James, Delilah Devlin, Gennita Low, Maryann Jordan, Geri Foster, Lexi Post, J.M. Madden, and Sharon Hamilton. Enter here to win one of the 25 prizes. 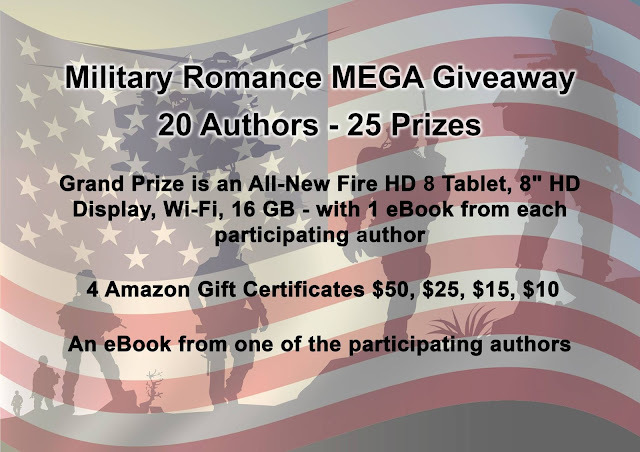 Grand Prize is an All-New Fire HD 8 Tablet, 8" HD Display, Wi-Fi, 16 GB - with 1 eBook from each participating author. Also be sure to stop by the Proud to Read Military Facebook Party November 11th.